He discovered Network Marketing 8 years ago and went on to fail in four different companies before realizing that the companies were not the problem but his lack of personal development. He went on to become a top recruiter and leader in his company, and has been featured in industry publications like Networking Times, and was featured along global MLM bloggers as one of the top 32 MLM bloggers to watch dominate Network Marketing. 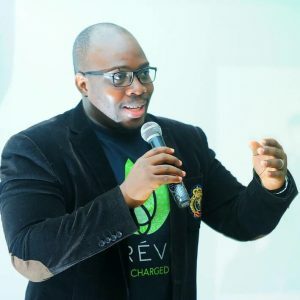 He is the founder of the proMLM movement, which equips Network Marketers with the mindset and skills to grow their businesses, and is also an in-demand speaker at generic MLM training events in Nigeria. 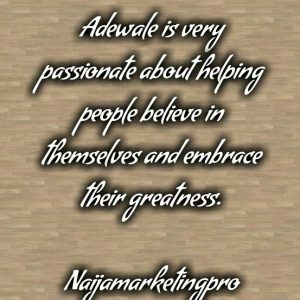 Adewale is very passionate about helping people believe in themselves and embrace their greatness. The following excerpts were gotten from the interview. Ayodeji Oladeji Charles : Can you tell us a little about Yourself, your journey, what led you to network marketing and how long has it been? 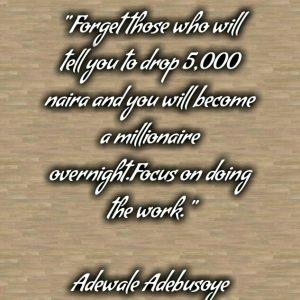 Adewale Adebusoye : My name is Adewale Adebusoye, and getting into Network Marketing was a journey that started for me in 2009. I always wanted to be successful, and at a young age, I was attracted to personal development books, and audios. I wanted to be an entrepreneur, but the traditional way seemed very daunting to me. So on my birthday in 2009, a lady from the USA dropped a link on my wall, and I clicked on it, filled out a form, she followed up with me, and thats how I got started. I proceeded to fail in that company, and in 3 other MLM companies, and at a point, I left MLM and went back to a paid job (especially as I had relocated to Nigeria) but I wasn’t fulfilled. When I was asked to take a look at this business, I rejected it initially, but I had to do some deep thinking to find out why I did not succeed in the past. I had to take responsibility for my past failures, and own up to the fact that I quit too soon, and I didn’t give it 100%. I decided I was going to run my current MLM opportunity with 100% commitment, and I jumped into it, and I never looked back. Ayodeji Oladeji Charles : Why is prospecting important in network marketing? 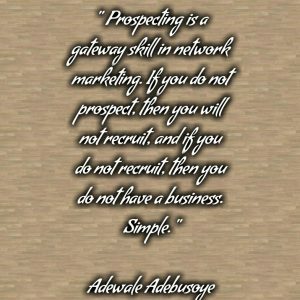 Adewale Adebusoye : Prospecting is a gateway skill in network marketing. If you do not prospect, then you will not recruit, and if you do not recruit, then you do not have a business; Simple. Ayodeji Oladeji Charles : How can someone start up a communication with a new prospect you don’t know? Adewale Adebusoye : First I will try to build rapport with the prospect. I might just get their contact details initially and NEVER talk about my business. Then in the process of building rapport, I will find a way to find out if the person is open to taking a look at my business. If they are not open, I do not push it, and I move on to the next person, but keep the relationship friendly. If they ARE open, then I will take it further. Ayodeji Oladeji Charles : What are the mistakes in prospecting and how can they be avoided? Adewale Adebusoye : There are MANY mistakes but the most common mistakes are on social media. You will see someone who will just dump their entire compensation plan into your inbox (it happened to me today), without even building rapport, or getting to know you. Its lazy and most times people will block you. Learn the skill of prospecting, and be a professional, and things will be better for you. Ayodeji Oladeji Charles : Why do people fail in prospecting? Adewale Adebusoye : Because they do not realize prospecting is a skill that takes time to learn. And for most people, they are not willing to learn it. Ayodeji Oladeji Charles : Why is prospecting all about relationship building? Adewale Adebusoye : Because you are dealing with human beings and humans do business with those they know, like, trust or look up to. So if I don’t feel any of those emotions for you as a total stranger, why would I do business with you? Ayodeji Oladeji Charles : What are the do’s and don’t’s of prospecting for newbies? 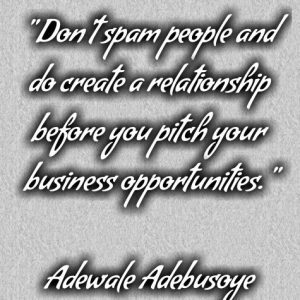 Adewale Adebusoye : Don’t spam people and do create a relationship before you pitch your business opportunities. Ayodeji Oladeji Charles : Is Facebook the only source of leads for prospecting? If Not, then where again can we find leads? Adewale Adebusoye : Leads are everywhere. Online and offline. You just have to be aware. However, Facebook has like 2 billion users right now, and its hot. IF (big IF) you know what you’re doing, and you’re ready to learn skills like running Facebook ads, you can generate leads on demand. Ayodeji Oladeji Charles : How can you successfully follow up a prospects to sign up? Adewale Adebusoye : For me personally, I automate my follow up system. But you can do it manually, by getting a notebook, making a name list, and tracking how many of your prospects have seen your presentation. It might be tedious but it works. Also, when following up, do not be pushy. Just be friendly, and let them know you were just checking on them. 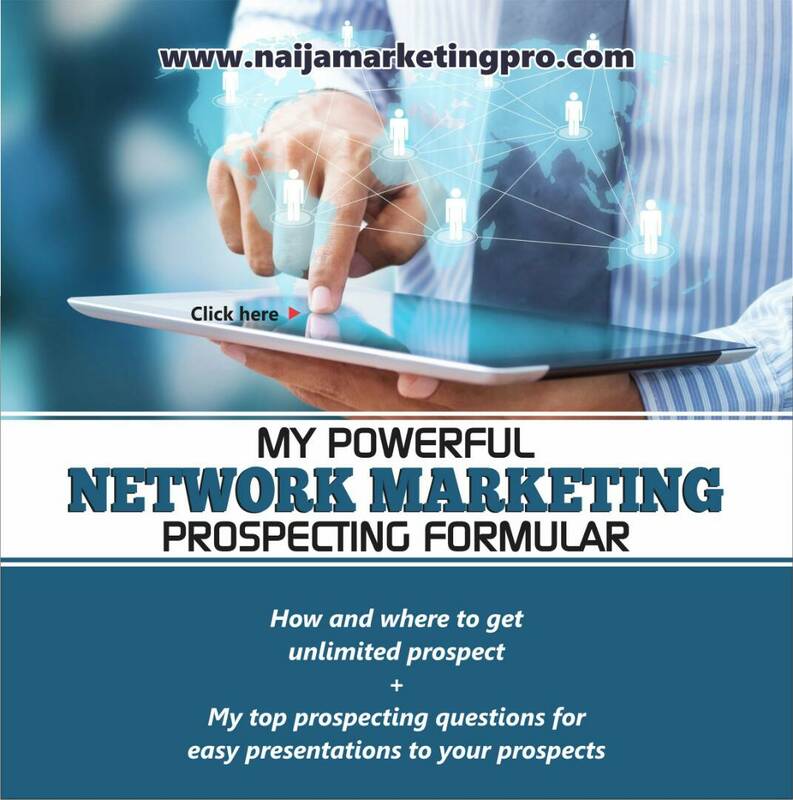 Ayodeji Oladeji Charles : As a network marketer, how do I double up my prospecting power and recruits more reps? Adewale Adebusoye : Its simple. Set a target to get more eyes on your company presentations. So you could run paid ads on Facebook and invite people to talk to you, or you could put them through a recruiting system, or you could just chat with people on Facebook, build rapport, and do a Skype or Facebook video call to build the relationship and seal the deal. Adewale Adebusoye : It depends. Network Marketing is a real BUSINESS, and so, only business minded youth should venture into it. The perception most people have about MLM is that it is baba ijebu. You put in 5000 naira and N1000,000 comes out in 20 days. NO. MLM is a real business with real products which can be exchanged in the marketplace for cash, and you must approach it with the mindset of running a real business. If the youth can adopt the right mindset, then fine. If not, then it might be best to find a job or do something else, rather than become an MLM casualty. Ayodeji Oladeji Charles : What do you do after work? Adewale Adebusoye : I read books, I watch movies at the cinema at times, and I go through MLM and Internet marketing courses. My brain is always working so for me work never stops. Ayodeji Oladeji Charles : What encouragement/words do you have for Naija Marketing Pro Community? 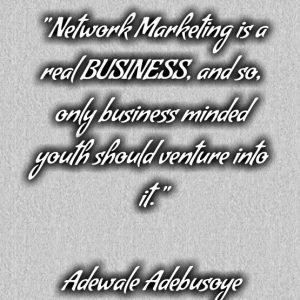 Adewale Adebusoye : Network Marketing is the greatest profession on earth. A long time ago, I was struggling in my MLM business. I was living in Holland then and I didn’t have connections and couldn’t talk to people. I reached out to one of our MLM coordinators then for help and he told me this. Network Marketing will pay you IF and only IF you are willing to learn the skills and put in the work. Abandon the get rich quick mindset. Treat it like a profession. Give it 4-5 years of serious effort and commit to learning the skills. And by Gods grace, you will never have to worry about money again. as Go Pro like Eric Worre will say, and you will reap the reward.